Marineland Dolphin Adventure in St. Augustine, Florida has an amazing history! They were pioneers in underwater filming and in marine research.They were the most visited tourist attraction in the entire state of Florida in their heyday. They are home to the oldest dolphin in care anywhere in the world and their facility was the first research site to host a dolphin birth. 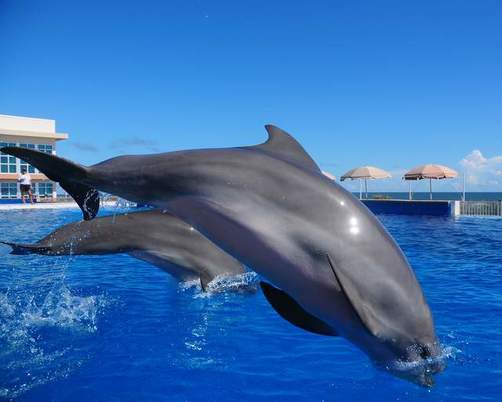 Marineland Dolphin Adventure is an enjoyable, educational experience in an amazing Atlantic beach setting. In June 1938, Marineland opened under the name Marine Studios. More than 30,000 guests showed up on that first day. To put Marineland's popularity into perspective, you should know that Disneyworld only had 10,000 visitors on its opening day! The original vision for Marineland was to duplicate "marine life as it exists in nature for the purpose of filming scenes for motion pictures and newsreels." Marine Studios became the ideal location to meet Hollywood’s growing demand for underwater footage. Over the years, many film and television producers utilized the studio for filming including the classic Tarzan films starring Johnny Weissmueller, Revenge of the Creature and Benji where the canine star became to first dog to scuba dive. By the 1950s, Marineland was drawing more than 500,000 visitors a year. Joan Whittemore, Marineland's Sales Manager, is very proud of the facility's place in Florida and U.S. history. "The history is amazing here. In the 1950s and 1960s, we were the most visited tourist attraction in Florida. This is the first place to have a birth of a live dolphin. Our oldest dolphin is 59 years old. She is the oldest dolphin in care anywhere in the world. Her name is Nellie and she holds two honorary degrees. Ernest Hemingway came here. One of our original owners was the grandson of Tolstoy." Whittemore is just as proud of Marineland today. "Our dolphins are very playful and love to play catch with our visitors. The dolphins will toss balls out of the pool into the audience. If you toss the ball back, they may play catch with you for 15 or 20 minutes.We do weddings on site and the dolphins jump behind the bride and groom during the photos. We host children's birthday parties here too. We have two programs where you don't even have to get in the water. We have a touch and feed program and a dolphin painting program where the dolphins paint a picture for you!" That's right! The dolphins paint a picture! In the Dolphin Designs program, you get to choose up to three colors for a dolphin to paint on a canvas that you hold over the water. Once the painting is complete, you have the opportunity to interact with your dolphin artist and you get to take you dolphin art creation home with you as a wonderful and unique souvenir. Price: $90. General admission guests are able to view the dolphins through 6 x 10 ft acrylic windows as they swim, play and interact with guests in programs alongside the pristine Atlantic coastline. For a more in-depth, historical experience, the Behind the Seas Tour offers "a behind-the-scenes and below-the-decks tour of our facility and new animal exhibits." The Behind the Seas tour includes General Admission and highlights "Marineland Dolphin Adventure’s unique and fascinating history spanning nearly 75 years, starting prior to its 1938 grand opening as an underwater film studio, and featuring actual materials and artifacts from the park’s extensive archives." Guests of the Behind the Seas Tour will also "see and learn more about Marineland’s pioneering work in aquatic animal research and the advancement of life support systems for aquatic environments" and "enjoy new exhibits featuring live animals of the Southeast region of the United States, and will absorb information on the importance of the Gulf Stream, ecosystems, conservation and invasive species like lion fish, green moray eels, jellyfish, lobsters and other species wreaking havoc on native populations along the eastern seaboard." Marineland Dolphin Adventure is open every day from 9:00 a.m. - 4:30 p.m.
For those traveling with Special Needs, "Marineland Dolphin Adventure strives to provide a positive experience for all of our guests, including those with special needs. For everyone's safety and comfort, please advise us if there are any emotional, behavioral, or physical conditions that could affect a guest's participation so we may plan accordingly. Click here to provide us with pertinent information, and we will make every effort to provide everyone with a memorable experience. If you do not have access to e-mail, please call (904) 471-1111, ext. 112 or 877-933-3402, ext. 112." Marineland Dolphin Adventure in St. Augustine, Florida is not a theme park and it is not SeaWorld. It is a Florida icon with an amazing history and it offers an enjoyable, educational experience in an amazing Atlantic beach setting. Watch our video of Marineland below.